Survey data show that until recently, even in reliably blue-voting states, more people identified as conservative than liberal. Just this past year, five more states flipped to liberal-leaning, including a clean sweep of the West Coast:, Washington, Oregon and California. Washington state is something it’s never been before: Liberal. 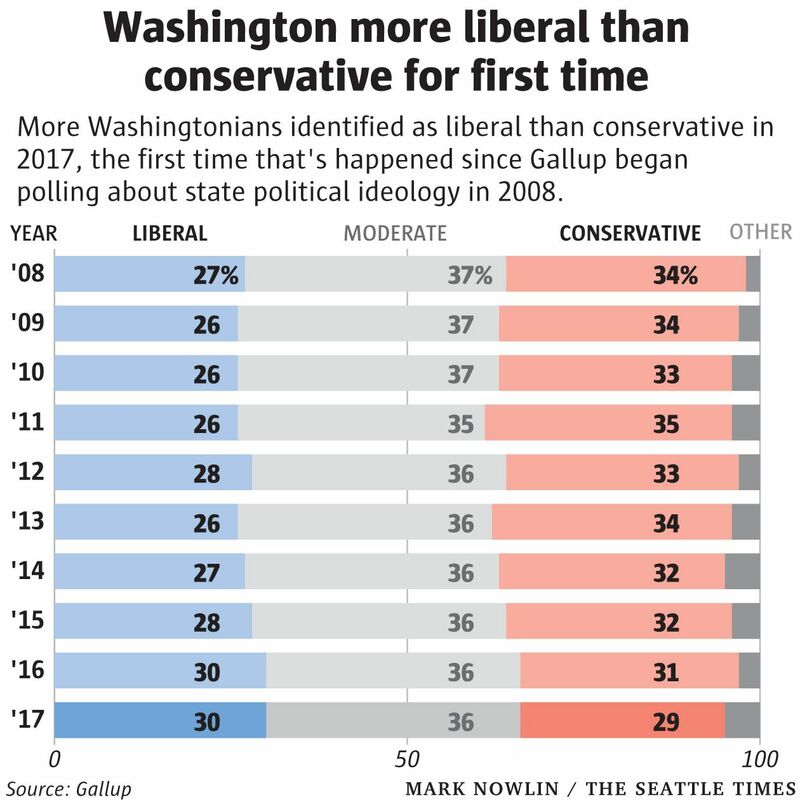 Polling giant Gallup, which has been monitoring the political climate of all 50 states each year since 2008, found that more Washingtonians identified as liberal than conservative in 2017 — the first time that’s ever happened. 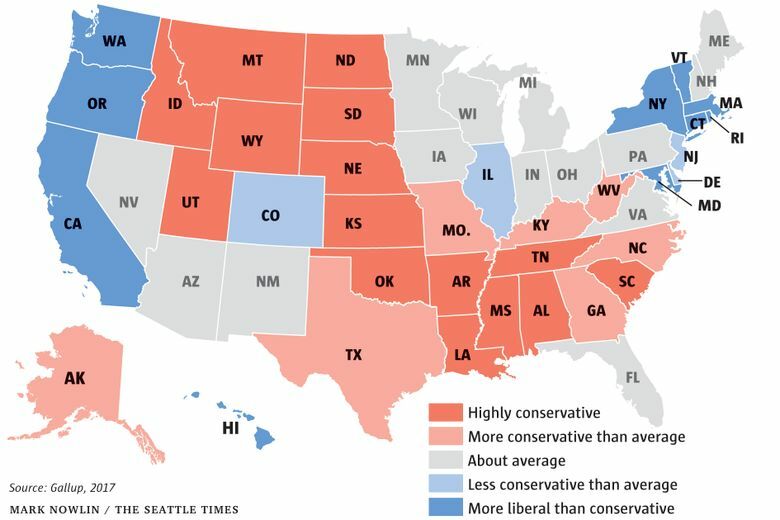 I know what you’re thinking: Hasn’t Washington been a reliably “blue” state for at least a couple decades? That’s true. We haven’t gone for a GOP presidential candidate since Ronald Reagan in 1984. And indeed, in another recent Gallup poll, we tied with New Jersey as the 10th most Democratic state — which, by the way, marks Washington’s debut on Gallup’s top 10 list of blue states. Of course, many parts of Washington are staunchly Republican, but in statewide elections they are consistently offset by the population-heavy Puget Sound region, which is overwhelmingly Democratic. But this new poll, which was released earlier this month, didn’t ask folks about how they vote — it asked how they identify, politically speaking. Gallup asked respondents whether their political views are very conservative, conservative, moderate, liberal or very liberal. The polling was conducted across the country on a daily basis throughout the year. In total, more than 180,000 people were interviewed, including about 4,700 in Washington. Last year, 30 percent of state residents said they were liberal or very liberal, edging out those who identify as conservative or very conservative by just one point. The percentage of liberals remained unchanged from 2016, but conservatives dropped by two points, which flipped the state to the liberal side. Even so, the plurality of Washingtonians — 36 percent — identified as moderate. That was true of most other states, as well. There were 17 states in 2017 where conservatives were more numerous than either moderates or liberals. And just one state (not counting the District of Columbia) where liberals rank as the largest of the three groups: Vermont. Indeed, the Green Mountain state ranks as Gallup’s most liberal for 2017. Thirty-nine percent there identified as liberal, compare to 25 percent conservative — a 14-point spread. Massachusetts came in second, but has a special distinction: Conservatives are rarer there than anywhere else, making up just 22 percent of the population. No matter how you slice the data, Wyoming comes out as the most politically right-wing state. Forty-six percent identified as conservative, compared with just 13 percent who say they’re liberal — a 33-point difference. Mississippi ranks second, with conservatives holding a 29-point advantage. Washington was not the only state to flip from conservative to liberal last year. In fact, we were one of five, the others being Oregon, California, Maryland and Rhode Island. That more than doubled the number of liberal-leaning states, bringing the total to nine (New York and Connecticut flipped in 2016, joining already-liberal Vermont and Massachusetts). Two other states, Delaware and Hawaii, were evenly split between liberals and conservatives. No state flipped the other way, from liberal to conservative. Remarkably, when Gallup started polling every state about political ideology back in 2008, there were only two that were liberal-leaning: Vermont and Massachusetts. And even those two switched to the other side in 2009 and 2010, giving conservatives a clean sweep of all 50 states. Since then, though, the pendulum has started to swing in the other direction. Last year’s haul of five states to the liberal side was the biggest single-year change. Conservative-leaning states now total 39. How much of that change is a reaction to the first year of Donald Trump’s presidency? The pollsters don’t probe that far, so readers will have to decide that for themselves. But Gallup notes that in their national poll from 1992, conservatives hugely outnumbered liberals, 36 percent to 17 percent. Over the past quarter century, there’s been a slow but (mostly) steady shrinking of that gap as liberals’ ranks have grown. Last year, 35 percent of U.S. adults identified as conservative, compared with 26 percent liberal — a nine-point conservative advantage. That marks the first time that conservative edge is in the single digits. The gains made by liberals are coming at the expense of moderates, whose share of the population has shrunk from 43 percent in 1992 to 35 percent last year. According to Gallup, the trend toward increased liberal identification is almost entirely due to Democrats’ having adopting the term. Demographic changes are also tipping the balance toward the left, with younger, more liberal adults replacing older, more conservative Americans. According to Gallup’s data, adults under 30 are more likely to be liberal than conservative by 9 percentage points, while Americans age 65 and up lean conservative by 22 points. Correction: An earlier version of this column incorrectly identified the percentage of U.S. adults that identified as conservative last year.